Sun., March 12, 2017, 10:43 p.m. Distance certainly doesn’t deter Gonzaga fans. Last week when the Zags won the West Coast Conference championship in Las Vegas, the Zags weren’t short of any support. GU fans from Spokane and elsewhere made the Orleans Arena feel like the Zags were home in the Kennel. They overtook the building and made the arena shake nearly every time the ball left the hands of the Zag and fell to the bottom of the net. But Gonzaga head coach Mark Few knows postseason won’t always be that way, especially heading into the NCAA tournament where the Zags could be crossing into areas where Bulldog fans are hard come by, such as Salt Lake City. Five years ago when Few’s 2013 Zags strolled into what was previously known as Energy Solutions Arena, they found themselves in a building full of fans that were jumping on the bandwagon of any team who had to face top-seeded Gonzaga. In the first round, GU lost themselves in an overwhelming amount of cheers for 16th-seeded Southern and nearly fell, but they managed to hold on to a 64-58 win and advance to the round of 32. Two nights later the Zags returned to an arena full of people who had switched out their Southern gear for some Wichita State shirts. Chants for GU were drowned out by the roars of thousands of people pulling for the underdog, and Wichita State bought into the new-found support. The Shockers rallied with a string of 3s that gave them enough momentum to move to the next round as the Zags watched one of their best seasons in school history come to a screeching halt in Salt Lake City. “There’s obviously some bad memories there,” redshirt senior Rem Bakamus said on Tuesday. Bakamus and senior center Przemek Karnowski are the only Zags left who were on the 2013 roster. 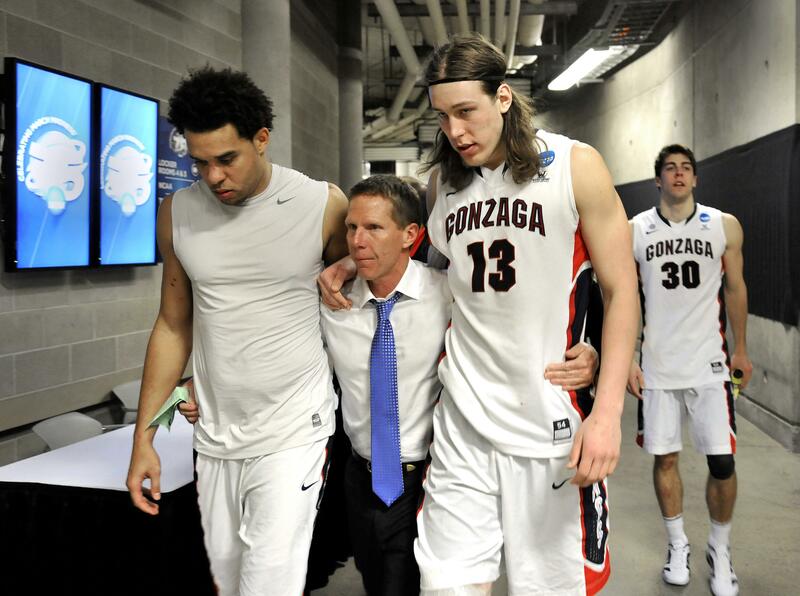 They both sat on the sidelines for Gonzaga’s final game that year. “I just remember feeling like it was an away game because all the fans from the other teams were cheering against us,” simply because “everybody loves a good upset,” Bakamus said. Last week, Few made it clear that he would not be thrilled about another trip to Salt Lake City. Instead, he had hoped for a spot in Sacramento where support for Gonzaga is stronger. On Sunday, it was announced that the Zags would take the fourth No. 1 seed and would return to Utah’s capital this week to compete in the same arena – renamed Vivint Smart Home Arena – that had attracted such little support for the Zags in 2013. After brackets were announced, Few said it ultimately didn’t matter where the Zags played, even if it meant playing in a building that could bring about some bad memories, and his players agreed. “It’s a different year,” Karnowski said. The big man said the Zags hadn’t thought much about the last time they visited Utah in the postseason. Karnowski said after so many fans turned up in Las Vegas for the Zags, he’s hopeful that the atmosphere in Salt Lake City won’t be anything close to what it was like when he was there as a freshman. “It’s four years later, you know. So I hope there’s going to be a lot of Zag shirts and a lot of Zag people over there that are going to come a support us,” he said. Published: March 12, 2017, 10:43 p.m.